A keen tour of Sydney, Australia—streetwise and savvy, both culturally and historically—from Moorhouse (Sun Dancing, 1997, etc.). The town named Sydney may have risen where the first convict ships from Britain hove into the glorious natural harbor, but the aboriginal population was there well ahead of them. Moorhouse begins his story with the Aborigines, by way of their Dreaming and artwork and their precarious survival, disavowing anything more than the briefest of introductions but delivering a respectful measure more. 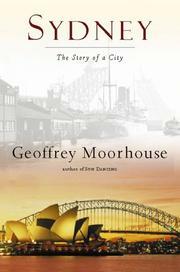 Taking the role of observer—though he is more than happy to sample the city’s food and beverages and skim the waters of Tank Stream and the harbor—Moorhouse’s sedate and ever-so melancholy voice moves on to touch all over Sydney’s history and landscape. He recounts the sorry years of the town as a penal colony, the joys of its Botanic Gardens; he delves into institutionalized racism and the bullying of the church in secular life. He takes readers on a slow ramble through the remnants of a gracefully proportioned cityscape that early learned to separate home and industry and put the emphasis on greenery, which only recently and with unfortunate results has “taken a back seat to the needs of capital” in the form of tacky high-rise financial buildings. He explains the importance of cricket and horse racing, the theater and opera and the public library. But most of all he sings the praises of the city’s fine, safe harbor. It is a waterscape that has smitten Moorhouse, a shimmering world that is the final reference point to the land that surrounds it, a working harbor that is still a valued presence when many cities have come to shun their watery origins. Moorhouse is a crackerjack travel writer and storyteller, and he has impeccable timing: Sydney will host the 27th Olympiad this summer, which ought to spur plenty of interest in the city.